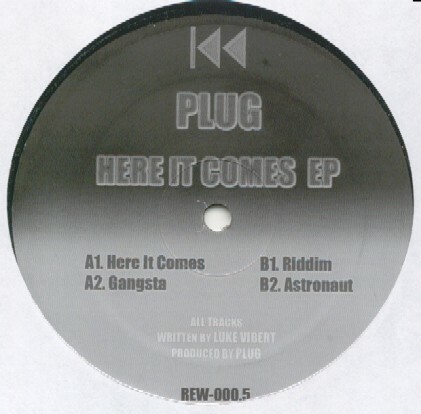 Note : 4 track ep of as yet unreleased Plug tunes made 10 years ago. All tracks written by Luke Vibert. This pre-Rewind #1 catalog number is appropriate as Luke Vibert returns under his 1995 'Plug' moniker. Vintage, previously unreleased tracks unearthed for this 4-track EP. The first new Plug release in many years will be coming out sometime in the near future on Soundmurderer's Rewind Records label. Here It Comes is slated as a 4 track EP of vintage, yet previously unreleased Plug tracks. Along with the second Kerrier District LP, new Amen Andrews and a new grimey alias, Spac Hand Luke, as confirmed releases by Rephlex, 2006 looks to be a plentiful year.